The alarmingly sharp rise in air pollution caused by motor transport in and around towns is caused by, among other things, micro dust, most of which comes from diesel engines. This fact gives high priority to research into vehicle conversion to electric power. After about seven years of experimenting with cars converted for electric propulsion, we've concluded that the weight of the batteries is a great disadvantage in converted cars where the electric motor is connected to the wheels via the existing gearbox. (To overcome the energy losses (amounting to 35 to 40%) in the gearbox of a converted car, we need to use an extremely heavy package of batteries in order to achieve a modest action radius of around 100 kilometers). 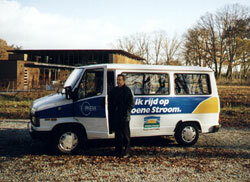 We showed our electric mini bus at a school (left). The batteries of the electric city bus in Boxtel are loaded with renewable energy (right). In the autumn, we expect the first converted car driven by two newly designed and electronically operated twin-electric motors directly connected to the front wheels. With this new concept, called 'the Wheel', it's now possible to save up to 50% in energy, and diminish the weight of the battery pack by the same percentage. 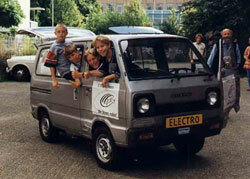 Our experiments were made possible by the inventors of 'The Wheel', the Dutch/American firm of E-Traction in Apeldoorn. (www.thewheel.nl).